Bryan and Shellie McCary were nominated for the Bryant True Heroes Award by their friend Sarah Brant who has known them for just 6 years. She shared that from the very beginning their outstanding compassion for others has always shined through. They are the first people to offer a helping hand and go above and beyond without ever being asked. Sarah can recall countless stories of their compassion and generosity, but shared a few that gave her a glimpse of their selfless devotion. They live in a close-knit community and when one of their neighbors who is a single mom needed help with some flooring Shellie and Bryan stepped up and helped install the floor for her. They have helped countless families with donating furniture, clothing, house hold items, meals and even helped with small house hold remodeling projects. In another situation, they opened their home up to one of their son’s football teammates. They took him into their home and family, helping him with his every day needs and soon became part of the family. They invested the time and love he needed to succeed as an individual and academically. As a faith-based family, Shellie and Bryan have always been very involved in church and volunteering for the community. Shellie felt called to step up as a sister in Christ to collect the stories of local women’s struggles and revelations. Not only did she share her own testimony she worked with her fellow sisters in Christ to share their story and help other women struggling through hard times and faith in her book Hearts Aligning. Most recently Shellie has stepped up to help support a mother of two who was diagnosed with stage 3 breast cancer. From daily meals, to 5k walks, and helping her hang up pictures, Shellie goes above and beyond. They’ve done all of this while raising 3 boys of their own. Currently they have one in the Marines and two working through their high school years. Sarah expressed the McCary family has always been the type of family to put others needs before themselves. She couldn’t think of one person, let alone a whole family, that is more deserving than them. The Bryant True Hero Award is a way to thank people who go out of their way to help others and positively impact their communities. 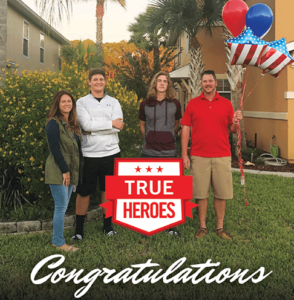 Not often recognized for their efforts, Bryant True Heroes are real people who are making a difference in their communities every day without stopping for a moment to receive recognition for their actions. “Upon meeting the McCary Family it was evident that they are not used to being on the receiving end of the same generosity they give daily. They do not boast about their acts of generosity and selfless devotion to serving but freely give with all they have and all they are. Even in just a few moments of small talk you begin to feel like part of their family.” said Amy O’Grady, general manager for Charlie’s Tropic Heating & Air Conditioning. We know that just from the few stories we shared of their acts that they will continue to pour out to others in the Jacksonville community and forever be our True Heroes.